When treated cuttings fail to produce roots, growers often increase the Basal Quick Dip or Dry Dip concentrations. This is not always the best answer. Excess rooting hormones can inhibit of root formation. The basal end of the cutting is a sink point; the place where the rooting hormones are stored until they are used for root formation. The use of high rate Basal Quick Dip is not always a good method to overcome unsuccessful rooting. A better method may be to use the Basal Long Soak Method at low rates. 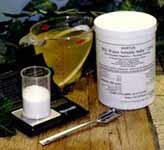 The suggestions for the use of Rhizopon AA #1, #2 and #3, Rhizopon AA Water Soluble Tablets and Hortus IBA Water Soluble Salts are based on the outcome of tests and experiments carried out by international testing stations, research centers, scientific publications and Rhizopon and Hortus USA's own research. Testing is essential. Suitable test rates should be used on a small portion of the crop before doing extensive treatment. Select the rate which provides the desired effect. The actual conditions at your facility may not be the same as the place were the data was obtained. You might find highly successful results if you vary the concentrations somewhat from the listed amount.